My review of the magical experience I had dining at Disney World this year continues. Have I mentioned how much I love Disney?If you missed part one, check it out here. This review will cover 50’s Prime Time Cafe, Mama Melrose’s, Tusker House, and Jiko. Spoiler alert: I’m already counting down the days until I’m back in the Happiest Place on Earth. If a Disney remake of a 50’s diner, complete with a waiter or waitress that will yell at you for putting your elbows on the table or not finishing your peas, isn’t for you, don’t eat at the 50’s Prime Time Cafe at Hollywood Studios. This restaurant has had a love hate relationship with vegan diners. They had a meal that was vegan, then removed it from the menu. When I last went two years ago, a nice chef made me a great zoodle dish, although it lacked in protein. That was what I was expecting to get when I arrived this year. Little did I know that the “house special” was a vegan ragu served over polenta. The way our waitress described the ragu, it sounded like vegetables in what I assumed was tomato sauce. Not being a huge fan of polenta, I asked for the ragu over whatever other veggies they had on hand. The waitress happily took my order and relayed it to the chef. Unfortunately, I had to run out after I ordered to catch my fast pass at the Rockin’ Roller Coaster and missed when the chef actually came out to talk with me. There wasn’t a problem with my order, he just had other options available. Once I got back, my lu nch was waiting for me. It turns out the ragu didn’t have sauce. 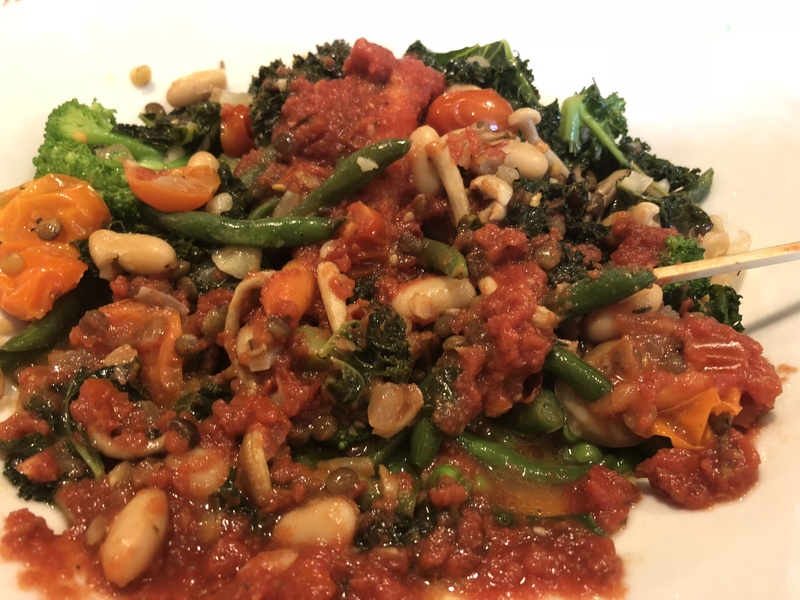 It was simply a medley of kale, mushrooms, cannelloni beans, and lentils. 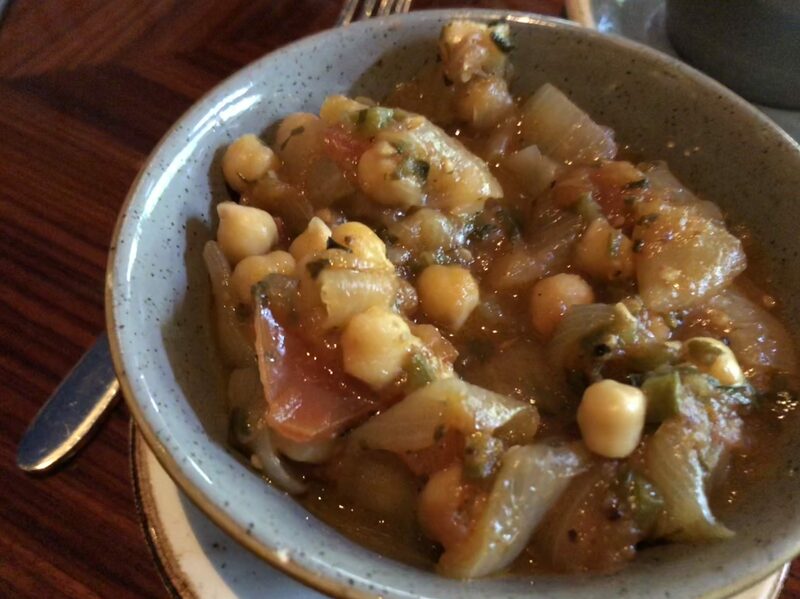 I was thrilled to see the legumes, but thought the dish needed sauce to make it come together. I remembered the marinara being gf/vegan and asked for a bowl of it to dump on. Our waitress check and confirmed it was. Once assembled together, the meal was really hearty. Overall, I really appreciate the new menu option. I hope they put the vegetable ragu on their menu permanently, as the current spaghetti and meatless meatball dish contains egg and therefore cannot be made vegan. I haven’t been to Mama Melrose’s inside Hollywood Studios since I was very young – long before celiac disease and switching to a plant-based diet. It’s a classic restaurant by the Muppet’s 3D theatre that still maintains the old Hollywood feel that once was found all over the theme park. With all the changes happening at the Studios, I hope they keep Mama Melrose’s around. The restaurant serves up classic Italian food with an upscale touch. While I’m sure some dishes like the chicken parmigiana and spaghetti with meat sauce have always been on the menu, they’ve added a few neat updates. One of them is the new vegan entree: Polenta Cake, Mushroom, and Herb Cauliflower. It’s composed of polenta layered with sautéed mushroom, spinach, and red pepper with a cashew-cheese sauce. When I dined there, one thing I was immediately impressed with was the variety of fresh produce featured on the menu. Noting my allergies, my waitress went and retrieved a chef. She offered to make me a special primavera utilizing her available bounty of vegetables and I happily accepted. In addition, she mentioned they carried gluten-free and vegan rolls and said she’d warm up some so I could have them with my meal. To be safe, the rolls (from Deanna’s Gluten Free) were warmed up with the plastic wrap still on them to prevent cross-contamination. This was the first time I’ve experienced a restaurant using this technique, and I appreciated knowing they were completely safe to consume. My meal arrived steaming hot and was absolutely delicious. It was hearty and satisfying and you could tell the quality of ingredients used. Overall, I think the quality of the food at Mama Melrose’s is definitely one of, if not, the best you can find in Hollywood Studios. I highly recommend checking it out. Tusker House in Animal Kingdom is basically the theme park version of Boma. Similar flavors, similar buffet, and the addition of table-side visits with Mickey, Minnie, Donald, Daisy and Goofy. That said, the food is always solid, although not quite level of Boma. Like Boma, an allergen menu is given to you when you are seated. There aren’t a ton of gluten-free and vegan options ready-to-eat on the buffet, but I’d say this year there may have been more than in previous years. However, the chefs are more than willing to make customized heaping plates of food and I’ve never left not pleasantly stuffed. 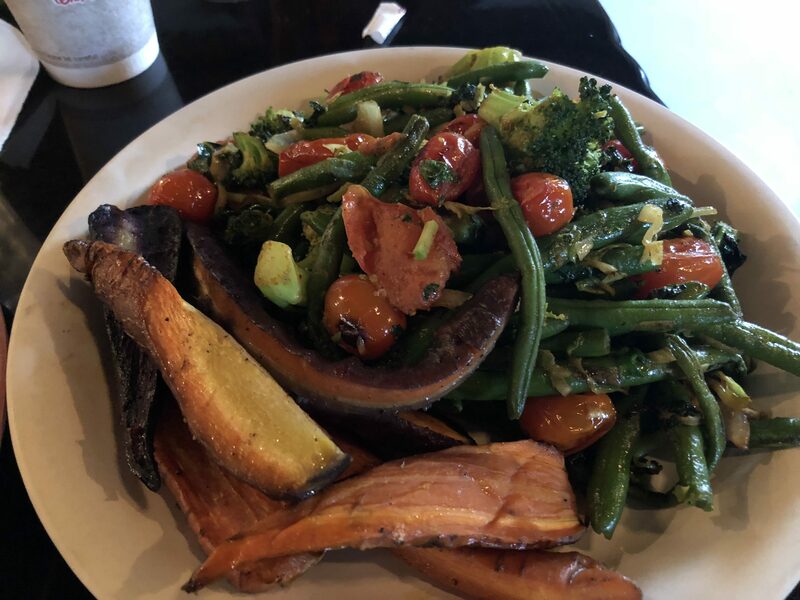 On this visit, the chef made me a giant plate of tandoori-spiced vegetables and roasted root vegetables; another plate of collard greens and roasted red peppers, a third plate of black eyed pea salad, and a final salad plate. It’s hard to say what was my favorite. 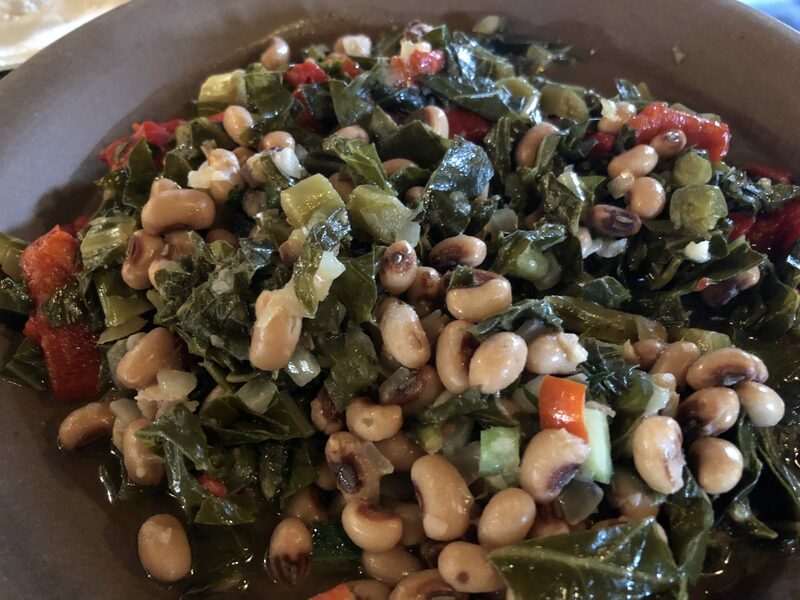 I ended up mixing the black eyed pea salad with the collards and it was a great combination, but the tandoori vegetables also were on point. Taken together, it was a fantastic mix of flavors that paired well together. The chef, per usual, went out of his way to make sure I had more than enough food and came back to check how I liked everything and if I wanted more of anything. If you’re headed to Animal Kingdom, Tusker House is well worth the price you pay. Plus, you can get your picture taken with the characters without waiting in line. 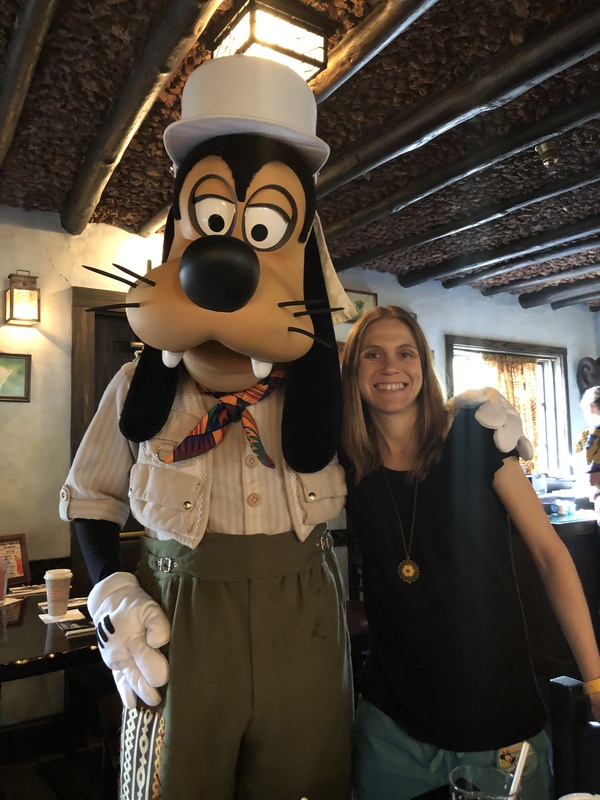 This year, Jiko at Animal Kingdom’s Lodge’s Jambo House wins the award for best restaurant of my 2019 Disney trip. In reality, Jiko could be just the best restaurant in Disney World period. For another Boma comparison, Jiko is Boma in a fine-dining, table service experience. 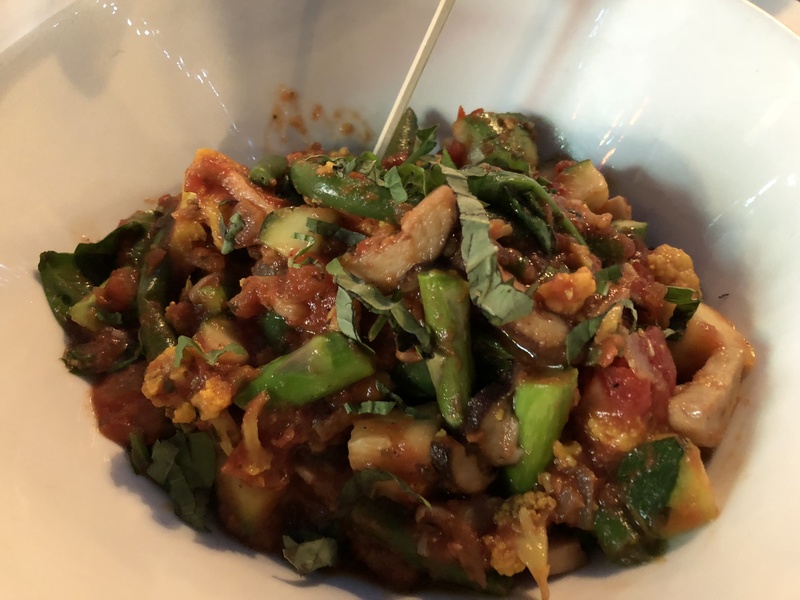 Jiko remains one of the only places to maintain a dedicated vegan menu and the chefs can customize many of those dishes to be gluten-free and vegan. 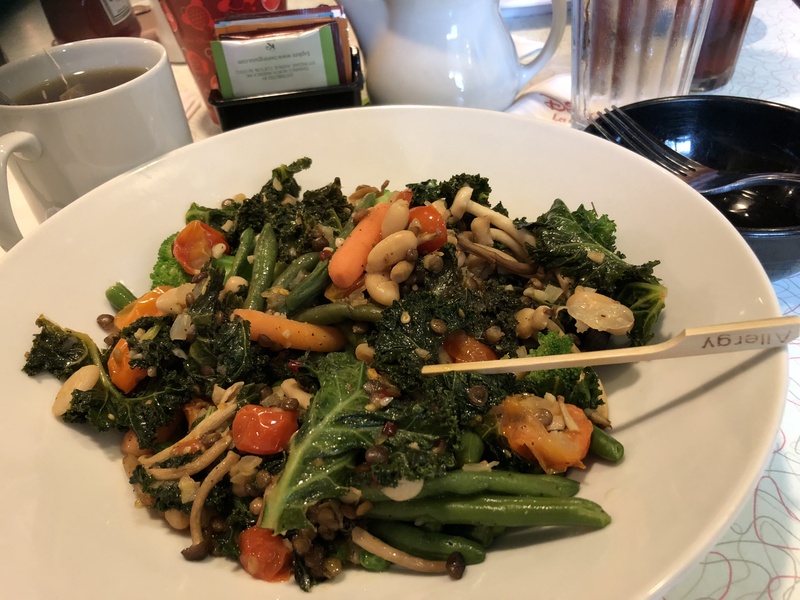 And fortunately, my favorite meal continues to be a delicious option on both the special vegan menu and the main menu, and is already gluten-free. 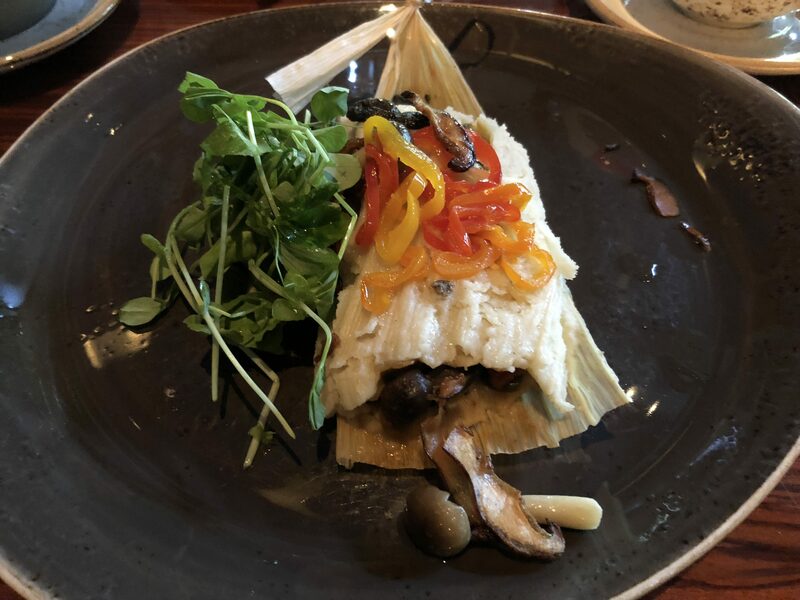 That dish is the West African Koki Corn (a vegetable tamale), which comes with mushrooms, avocado, poblano-tomatillo purée, and roasted red pepper sauce. It’s fantastic. But Jiko food is too good to only order one thing. 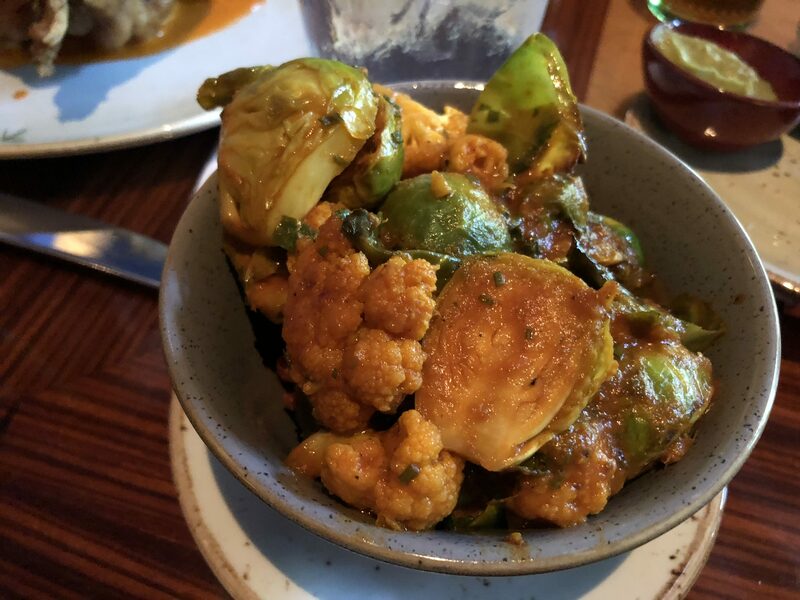 So this time, I asked for curried roasted cauliflower and brussel sprouts and chakalaka with chickpeas. Oh boy, did Chef Eric deliver. Everything was perfectly spiced and the flavors married well. The koki corn is more on the mild side, the curried vegetables were spicy and the chakalaka is sweet and almost sour. It was a symphony on my taste buds. Therefore, if you’re going to splurge on one fine-dining meal. Run, do not walk, to Jiko.